Indian Railways is all set to provide the ‘office experience’ for its travelers as laptops, printers and Internet would now be offered during the journey. To start with, such services would be introduced on India’s premier trains: Rajdhani and Shatabdi Express. Based on the feedback and usability of the services, the same would be rolled out for other trains as well. As per information coming in, Internet and Workstations powered with printers would be first implemented on long distance running Rajdhani Express from New Delhi to Southern India. As per the initial plan, a cabin would be carved in the pantry car of these trains, and Internet services would be offered on a per hour basis. The fee structures haven’t been finalized yet as officials are conducting various feasibility studies to make the service affordable and within the reach of the common man. What Is Office On Wheels Concept? Last month Government had mentioned in the Rail Budget that a concept of ‘Office of Wheel’ would be soon implemented and this is the first step in that direction. As per the plan mentioned during the budget, a separate coach would be added in the short-distance routes of premier trains wherein business travelers can pay a nominal fee and use work-stations, printers and Internet on the go. 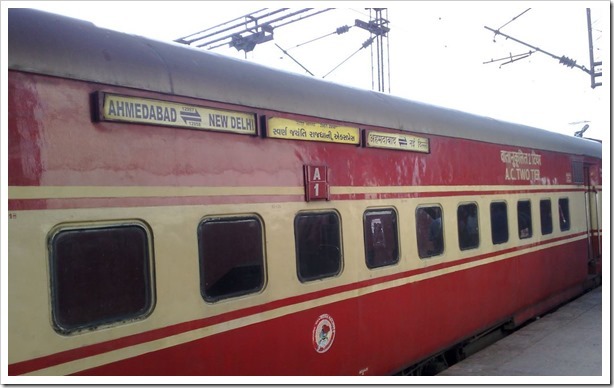 As per the official, Indian Railways has decided to implement the Office on Wheels concept on the following routes on a test basis: Delhi-Chandigarh, Delhi-Kanpur and Chennai-Bangalore besides popular Shatabdi Express routes of short distances. Office on Wheels would be a specially designed coach with comfortable seating arrangement, personalized catering service on the seats, having an office like environment. Business travelers form a big chunk of regular consumers of Indian Railways, especially on trains like Shatabdi and Rajdhani, and they need to be attracted if Indian Railways want them to stay with trains. With the introduction of low cost airlines in India, business travelers have been opting for flight instead of trains as the difference in fares is becoming less day by day and there is a huge saving in travel time as well. For example, for the Delhi-Chennai travel for September 18th, IndiGo is offering a seat for only Rs 5323, whereas AC 2 berth will cost Rs 2970. The difference of fares becomes less relevant as flight takes only 3 hours whereas 36 hours are required to travel by train. Similarly, for Mumbai-Kolkata travel, you can get a seat in SpiceJet only for Rs 4031 and it takes less than 3 hours with ‘On time Guarantee’ whereas train takes 18 hours and for AC II berth, you need shell out Rs 2820. By providing value added services like internet, workstations and printer in the trains, Indian Railways is certainly trying to lure those business travelers who don’t wish to waste time. For the others, who love the slow chugging of trains and the experience of witnessing India from a closer range can also use such service for entertainment purpose. What is your take on these new initiatives of Indian railways? Will it help them to lure business travelers? What should be the hourly charge of this service? Do share your opinions by commenting right here! Gud wifi can solve all the problem. But use at your own risk…. hahaha… Security expert speaks… But you are absolutely right.. It would be a goldmine for trojans and malwares..